Second hand sales are a fabulous resource for parents. They offer clothes, kid equipment (like strollers and baby carriers), and toys that are lightly used for a fraction of their original cost. 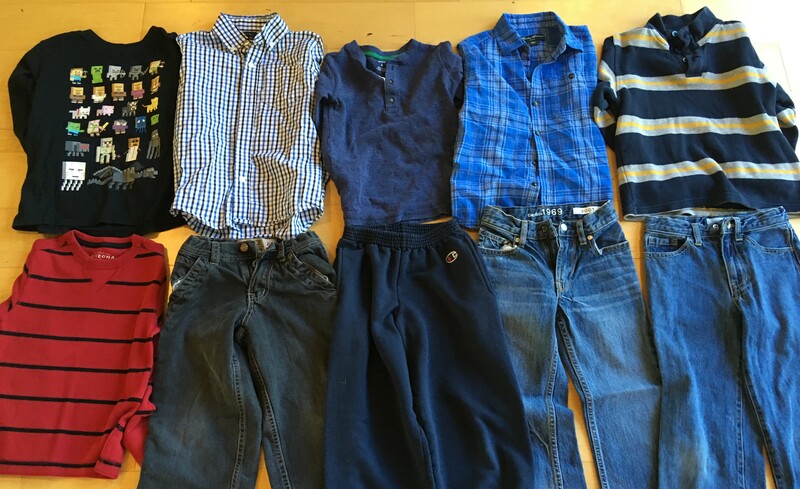 Over 25 years of parenting, almost all my kids’ clothes have come from consignment shops. I like them not just for the cost savings, but because it’s better for the environment, more efficient for me, and helps me be a more relaxed parent. Are you ready to learn more? I find that children’s clothes range a great deal in quality. Some will last through many children and countless washes, and others look awful after their first time through the laundry – they get “pills” all over them, or their colors run, or they have knees that tear out at the first tumble, or collars or cuffs that get all squashed up never to go flat again. At a consignment store, everything is still in good shape after being used, so I know my kid can’t do much worse to them. Most kids’ clothes are made from cotton. Cotton is terrible for the environment – it takes about 2500 liters of water – 660 gallons – to produce enough cotton for one shirt! Cotton is just 2.4% of the world’s crops, but of the pesticides used on the planet each year, 16% are used in the production of cotton. Let’s get as much use as we can out of every cotton shirt! I don’t enjoy shopping. I especially don’t enjoy shopping when I have to take a small child with me to the store! As a working mom, I also have limited time, and there’s other things I’d far rather do with it. If I walk into a kids’ clothing store, they have one rack that has a couple styles of shirt, then I walk to another rack with a couple more and another rack with a couple more. If I walk all around the store, they might have a dozen different shirt styles. And they might not all be available in a size 6. If I want more options, I have to walk through the mall till the next viable store. At the consignment shop I was at yesterday, I walked to the size 6 boys rack, and flipped through about 50 different shirts and 30 pairs of pants. I was able to pick out 6 shirts and 4 pants in much less time than it would have taken at the mall. And most consignment shops have some consignment toys stationed around the clothing racks so kids can play while their parent shops. I still remember 20 some years ago, when I bought my kids two really special matching outfits from Gymboree for a portrait session that were pretty pricey for my budget at the time. Even after the photos were taken, I was protective of those clothes… my preschooler and toddler really wanted to wear them but when they did, I’d spend the day saying “no, you can’t play with that, it’s too messy” and “no, you can’t eat / drink that – I don’t want to take the chance that you’ll spill it on your clothes.” I didn’t like being that fretful parent. When my kids wear cheap consignment clothes, I’m a relaxed parent. I let them finger-paint, play in the mud, eat nachos, and more. I don’t worry about stains and just let them be kids. Stain tip: There’s a lot of good stain removers out there – I personally find Shout works great for us. But here’s the key with stains… never ever put stained clothes in a dryer. The heat will set the stain forever!! So, I spray a stain – wash it. If the stain didn’t come out, I spray it again and wash it again the next time I do laundry. It doesn’t go in the dryer till the stain is gone. It’s very rare when I end up with a permanent stain. I donate my kids’ clothes when we’re done with them. Many parents I know get their kids’ clothes from the consignment shop, wear them till the kid outgrows them, and then brings them back to re-sell to someone else. Instead of taking cash for the clothes, they can get a larger payment with store credit that they then roll into the next season’s clothes. Here’s tips on how to make money selling consignment, and more tips. My oldest child wasn’t that picky about clothes and was happy to wear whatever appeared in the drawer. But my second child was very picky about her clothes. By the time she was about 12, she was doing all her own shopping. I would give her a budget at the start of the school year, and she could decide how to spend it. One year, she decided she really wanted the designer pants. So she blew her whole budget on one pair of pants and a pair of shoes, and otherwise had to wear all the clothes she already owned, whether or not they fit her current style. In all the future years, she’d go to Plato’s Closet and other consignment shops, and buy 6 – 8 new items – mostly by the designers she’d want to wear – but for a fraction of what they would have cost new. What is a second hand seller? Consignment stores / pawn shops. In a consignment shop, people have asked the shop to sell their stuff for them – if it sells, the store gets part of the money and gives the other part to the seller. If it doesn’t sell in a set amount of time, they ask the seller to pick it up. Most towns have a consignment shop – search online. Some are huge with lots of stock, some are small and you’re less likely to find what you need. Garage sales / yard sales / swap meets / flea markets / consignment sales – where people sell their own stuff or other folks’ stuff for a couple days in the yard or at a swap meet. (Just Between Friends is a nationwide group that does huge consignment events full of kids’ clothes. They can be a bit of a zoo, but people get lots of good stuff there.) You can get really good deals on stuff and you can find treasures – wacky delights you didn’t even know you were looking for till you found them. On the other hand, you can find a lot of junk you have no desire to own. Personally, the only time I did these was when it was a lovely sunny day in spring and I wasn’t quite ready to go home but didn’t have any ideas for what to do with my kids. We’d see a garage sale and go off on a quest to see what we’d find. Never anything substantial, but a fun little diversion. Craig’s List / ebay / Vinted / classifieds – people list specific items that you can search for. Helpful if you know exactly what you’re looking for. My son outgrew his favorite pair of shoes, and the company no longer made them, but we found a new pair in a larger size on ebay. Thrift shops – where all the goods they sell were donated to them. Anything that’s deemed “acceptable” is out on the shelves, so that means there’s a wide range of quality. There might be a barely worn Gap sweater from this year’s line next to an almost worn-out t-shirt from an event that happened a decade ago. If you’re willing to sort through a lot of junk, you can get some good deals. Note: some thrift shops donate all their proceeds to a charity, some (like our local Value Village) are for-profit businesses. Buy Nothing Groups: The Buy Nothing Project has created a huge network of Facebook-based local groups where folks who have things to give away post them to the group and where others ask for what they need. On my Buy Nothing group at this moment, people are giving away: an unused case for an iPhone 6, a bicycle seat, a glass-topped end table, a bag of size 3T boys’ clothes, company for evening walks on a local trail for other women who don’t feel comfortable walking alone, size 9 heels from 9 West, wood toddler toys, and so on. And there’s someone who’s due in a month who is asking for a crib, crib sheets, and a stroller. It’s pretty hit or miss what’s posted, but you may luck out. And if you have stuff to give away, it’s nice to give directly to a neighbor rather than donating to a thrift shop. The nicer the neighborhood – the better the used goods. At a garage sale in some parts of town, you’ll find things from Target and Walmart that the sellers are trying to eke as much money out of selling as they can. In another part of town, you’ll find items from Pottery Barn and Williams and Sonoma that they’re willing to sell for any amount you feel like offering. Inspect items thoroughly before buying, especially at thrift shops. Look for the subtle holes or small stains that a quick inspection wouldn’t have picked up. Be careful of recalls and hazards. In a used goods sale, you might find items that have hazards such as lead paint, or safety recalls. If you’re looking for money saving ideas for parents, you may also be interested in my series Cheap Dates with Toddlers which offers lots of free and cheap ideas for what to do with little ones. This entry was posted in Parenting Skills and tagged cheap, consignment shops, kids on a budget, money saving ideas, second hand on September 25, 2018 by Janelle Durham.